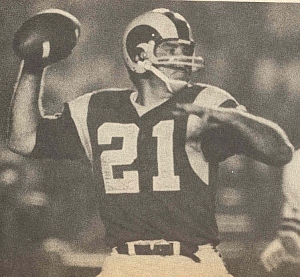 Hadl was taken by the San Diego Chargers in the third round of the 1962 AFL draft (and first round by Detroit in the NFL, who had visions of converting him into an option halfback) and, with the injury and subsequent waiver departure of QB Jack Kemp, saw considerable action as a rookie. With the signing of veteran Tobin Rote for 1963, Hadl learned from the bench for a year but gradually saw more action in ’64 and took over as the starting quarterback in 1965 – a season in which he led the AFL in passing yards (2798) and yards per attempt (8.0). With a strong arm, he fit well in Head Coach Sid Gillman’s passing offense, although he was prone to throwing interceptions. In 1968, Hadl led the league in pass attempts (440), completions (208), yards (3473), TD passes (27), but also interceptions (32). Following the 1970 AFL/NFL merger, he led the NFL in pass attempts (431), completions (233), yards (3075), and TD passes (21) in 1971, a year when he also was picked off 25 times, and in 1972 he led the league in interceptions thrown with 26. Still, he was selected to four AFL All-Star games and one Pro Bowl with the Chargers through ’72, passing for a total of 26,938 yards and 201 TDs in 11 seasons. Dissatisfied with changes to the post-Gillman offense, Hadl was traded to the Rams for 1973 and, with the dispatch of veteran QB Roman Gabriel to Philadelphia, he took over as the starting quarterback in LA. Rams went 12-2 to finish first in NFC West while leading NFL in total offense (4906 yards) and scoring (388 points) and the conference in rushing (2925 yards). Lost NFC Divisional playoff to Dallas Cowboys (27-16). With his performance declining in 1974, the Rams traded Hadl to Green Bay at midseason. He took over as starting quarterback for the Packers and stayed through ’75, but passed for just 9 TDs with 29 interceptions for a losing team. Hadl was traded again, to the Houston Oilers for QB Lynn Dickey, and finished out the last two seasons of his 16-year career as a backup. Overall, he threw for 33,503 yards (which ranked third all-time in AFL/NFL history at the time) and 244 touchdowns with 268 interceptions (second all-time) and had an 82-76-9 record as a starting quarterback in the AFL and NFL.